The steamship Formby is sunk by the German submarine U-62 twenty miles west northwest of Bardsey Island with the loss of fifteen lives including her Master. Among the dead is First Engineer John Moir killed at age 51. His son was killed when S S Stuart Prince was sunk in March of this year while serving as Fourth Engineer Officer. 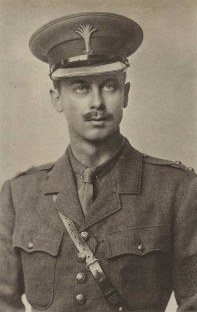 Captain Hume Buckley Roderick (Welsh Guards) is killed in action at age 30. His daughter will be born on the 20th June next year. Lieutenant Harold Buchanan Ryley (Suffolk Regiment) is killed in Palestine at age 49. He is the son of the Reverend George Buchanan Ryley. Lieutenant George Henry Waldron Gough (Cheshire Regiment) is killed in Jerusalem when he is shot in the head at age 23. His brother will be killed in March 1918 and their father will establish at King’s College Canterbury the Gough Photographic Prizes in their memory. Sergeant James Hubert Ronald Green (Royal Air Force) is killed at age 20. He is a 6-victory ace. Corporal James R Sutherland (Otago Infantry) is killed in action at age 29. His brother was killed in February of this year.